Sometimes, a comic book comes along that hits all the right notes right away. There's a clear voice, a confident narrative, from a born storyteller that captivates the imagination and fully immerses the reader. It was that way with Saga, The Walking Dead, Scott Snyder's Batman, and others. With Vault Comics' new 'Heathen' I'm putty in Natasha Alterici's hands. It's easily the next great comic book obsession. 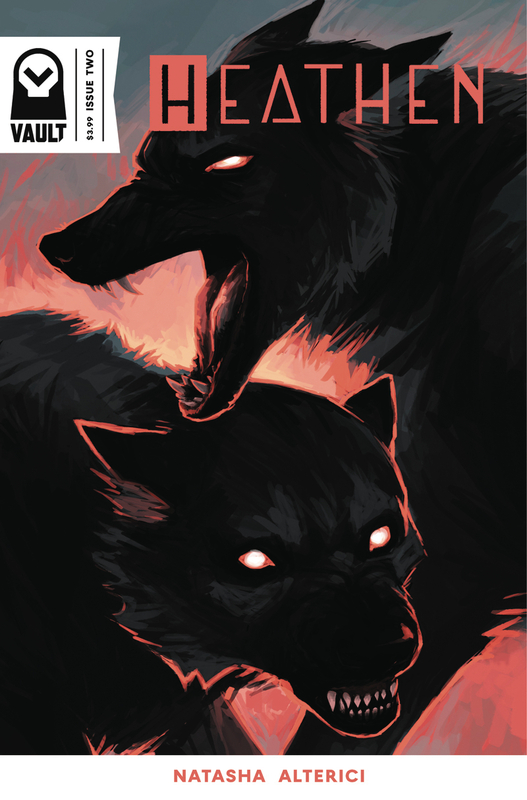 In only its second issue, the Viking warrior Aydis has already reached a pivotal point in her journey to free the Valkyrie Brynhild from Odin's curse. Along the way, Alterici introduces us to mystical wolves that talk. The story is moving along briskly but not rushed. There's no long drawn out preamble but with an engaging lead character like Aydis I'd follow her endlessly. If you're wondering about "talking animals" their scene is cute and informing without being schmaltzy or infantile. In fact, the dialogue is really well written, even Pixar-esque, in its quality. It reads like it was out of a fable. Alterici's dialogue in general has a certain rhythm to it that avoids being awkward or overly expository. More importantly, when Aydis speaks with Brynhild about what brought her there, the subtext about being true to yourself despite what society demands tells you all you need to know about her and why she leaves an indelible mark as the protagonist. As the artist, Alterici is kind of a minimalist. Backgrounds are mostly scarce but the book doesn't suffer for it. It draws the attention directly on the characters in the foreground. The designs of Aydis and Brynhild are perfectly juxtaposed - one a scruffy warrior with an antler adorned helmet and one a regal goddess. The ending is a surprise and Alterici captures the action with a concise use of panels but really conveys so much in the faces of Aydis, Brynhild, and Freyja. Great comics leave you wanting more, replaying what came before, and wishing 30 days would pass in a moment. 'Heathen' is that type of fantasy comic, that makes you fall in love with it only to be crushed 20-something pages later with a devastating cliffhanger. Vault Comics just snuck up on the industry with a blockbuster book of their own. Make sure you get 'Heathen' so you can say were there from the beginning before it blew up.